This unusual name, found particularly in the county of Lancashire, is one of the patronymic forms of the male given name Hugh. This was introduced into England by the Normans, after the Conquest of 1066, in the Old French forms "Hue" and "Hughe". The personal name is Old German in origin, as a short form of any of the various compound names with the first element "hug", heart, mind, spirit, such as Hubert, from "Hugberht", heart-bright, or Hubble, from "Hugbald", heart-brave. Hugh was a popular given name among the Normans in England, partly due to the fame of St. Hugh of Lincoln (1140 - 1200), who established the first Carthusian monastery in England. 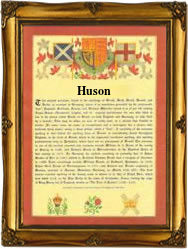 The patronymic surnames generated from the personal name range from Hughson, Huson and Hewson to Hooson, Hoosun and Howson, and the name development includes: William Huggesone (1327, Worcestershire), Henry Howsone (1332, Cumberland), and Michael Hwesone (1378, Essex). The marriage of Rodger Hooson and Alice Clarke was recorded at the Church of Allhallows, London, on September 30th 1670. The first recorded spelling of the family name is shown to be that of Richard Hughson, which was dated 1310, in the "Calendar of Letter Books of the City of London", during the reign of King Edward 11, known as "Edward of Caernafon", 1307 - 1327. Surnames became necessary when governments introduced personal taxation. In England this was known as Poll Tax. Throughout the centuries, surnames in every country have continued to "develop" often leading to astonishing variants of the original spelling.